While it may be more than a month away, humanitarian groups on both sides of the U.S.-Mexico border are already preparing for the possible arrival of the migrant caravan from Central America. Reports of a caravan of more than 7,000 people fleeing violence and poverty in El Salvador, Guatemala and Honduras—which has dwindled to about 4,000 as it makes its way north—led President Trump to say he would send as many as 1,000 troops to the U.S.-Mexico border to deal with what he referred to as a “national emergency.” But those who serve migrants every day on the border have a different perspective. “People’s lives are so untenable. That’s why the number [of migrants] has grown so quickly,” said Sean Carroll, S.J., the executive director of the Kino Border Initiative in Nogales, Mexico. “They see the caravan as a way to have a dignified life. “Whether they come as a caravan or as individuals, our mission is the same—to humanize their needs,” Father Carroll said. The Kino Border Initiative and other humanitarian groups are working with city and federal authorities in Mexico and with N.G.O.s to prepare “a comprehensive response,” he said. Over the last several months, Father Carroll has been seeing an increase in the number of immigrants from Guatemala, including a number of families. They typically must wait about a month to enter through the port of entry to ask to be received by U.S. officials, either as asylum seekers or to apply for a visa. Many who arrive at the border are uninformed about the process for legal entry, Father Carroll said. Some, frustrated with the long wait, attempt to enter the United States through the desert, he said. “They’re placing themselves at greater risk,” Father Carroll said, noting that hundreds of immigrants die each year while crossing through the desert. The U.S. Border Patrol reported apprehending nearly 200 migrants illegally crossing the border in two groups last month. “I’ve never seen that before,” Father Carroll said. Earlier this year, a caravan of 1,500 Central Americans headed to Tijuana, Baja California, just south of San Diego. By the time it arrived in Tijuana, the number had shrunken to 250, according to the Rev. Patrick Murphy, a Scalabrini priest who runs a shelter and social service center for migrants there. “That gives me some hope that all 7,000 will not be coming here,” he said of the Casa del Migrante. There are already, 2,500 waiting to apply for asylum in Tijuana, he said, and it takes more than a month to get an appointment at the port of entry. There are already, 2,500 waiting to apply for asylum in Tijuana, and it takes more than a month to get an appointment at the port of entry. Father Murphy is also concerned that the organizers of the latest caravan are not being completely candid with the migrants. It is unlikely that they will be able to enter the United States, he said. “If you create false expectations, you’re hitting them twice….The president has already said there will be no mercy,” he said. Of the 250 who arrived in April, Father Murphy knows of only three who received asylum. Camilo Perez-Bustillo, the director of research for the Hope Border Institute in El Paso, Tex., expects the caravans to continue, despite migrants not being able to enter the United States. “The likelihood is we have to gear up on the Mexican side of the border,” he said. If the current caravan does reach the U.S.-Mexico border, Mr. Perez-Bustillo expects humanitarian groups will have to set up refugee camps there. Some border shelters, like Annunciation House in El Paso, are already at capacity. Mr. Perez-Bustillo is keeping in touch with advocates that are accompanying the caravan and did not expect them to arrive at the U.S.-Mexico border before December. On Friday, the caravan was approaching Arriaga, in the Mexican state of Oaxaca. Many immigrants traveling north pass through this town and hop on “La Bestia,” or “The Beast,” a freight train that can bring them hundreds of miles north. While the “head” of the caravan may be in Oaxaca, Mr. Perez-Bustillo said the “tail” is still forming in Honduras and Guatemala. Last week, the Mexican government offered temporary identification papers and jobs to members of the caravan who had applied for asylum there, according to Reuters. Those who applied for asylum in Tapachula, just north of Guatemala in Mexico, had to wait there until their petitions were processed, Mr. Perez-Bustillo said. The caravan can offer more safety to migrants, who are often robbed or kidnapped on their journey through Mexico when traveling in smaller groups. The migrant caravans began more than 10 years ago and were originally organized around Holy Week. Mr. Perez-Bustillo explained that the caravans are not only a response to the circumstances that push immigrants to leave their home countries, but also the perilous journey north. The larger group can offer more safety to migrants, who are often robbed or kidnapped on their journey through Mexico when traveling in smaller groups. While the smaller caravan earlier this year was organized by Pueblo Sin Fronteras, a U.S. group, Mr. Perez-Bustillo believes the impetus behind the current caravan has roots in Central America. 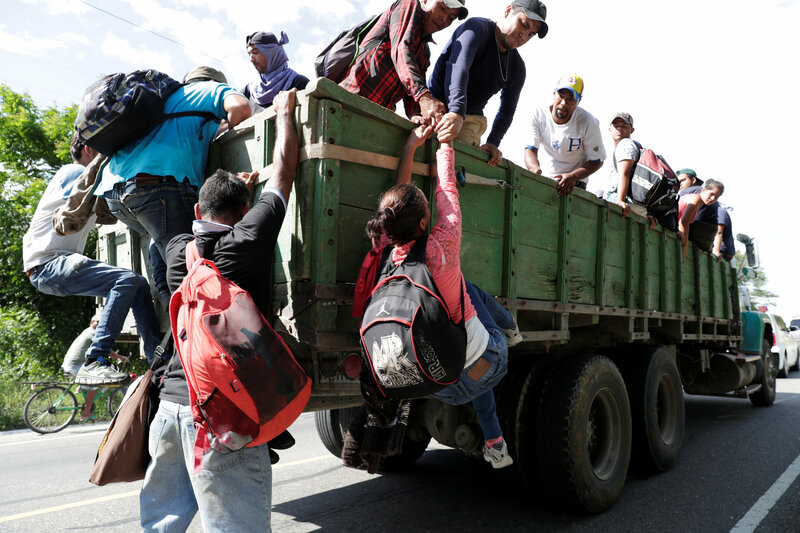 Connecting the caravan to events in the United States—like the midterm elections—fails to recognize migrants’ motivation, he said. That includes understanding the history of U.S. involvement in Central America. Mr. Perez-Bustillo noted past U.S. support for dictators in Honduras, Guatemala and El Salvador, which instigated the first waves of mass migration in the 1980s and led to the sanctuary movement. Religious groups began the movement to protect immigrants from deportation. “The current situation wouldn’t be so devastating were it not for the lingering effects of the 1980s,” he said. Last week, Mr. Trump vowed to cut U.S. foreign aid to Honduras, El Salvador and Guatemala for failing to stop the caravan. The United States was already scheduled to cut funds to these countries by 40 percent, according to Reuters. This post first appeared in The Catholic Spirit, the newspaper of the Archdiocese of St. Paul and Minneapolis, two days ago. I am reposting here because nothing in my opinion has changed in two days nor is it likely to change between now and election day. "The history of human migrations is full of epic stories in which people leave everything behind-- family, friends, flocks, homes, culture and community to be freed from oppression, privation, crime, or war, in the hope of a better life, if not for them then for their children and grandchildren. It is a story older than America but a part of our national creation story. Save but for the indigenous peoples who preceded us all, it is a story we share, we the sons and daughters of immigrants who arrived with little, left much behind and embarked on a perilous journey, a pilgrimage of body and spirit. Such travelers are precisely the "strangers" the Old and New Testments enjoin us to welcome, to shelter and protect, to embrace as brothers and sisters. The words of our brother Jesus make it clear that this brotherly (and sisterly) love is exactly what is needed to overturn the uncaring, even muderous tribalism that has plagued humanity since our time began. Too many of us devout Christians have become what we once despised--oppressors of the body and soul of "others." Whether the oppression is that of enforced poverty, social and economic marginalization, cultural obliteration, or criminal violence, drug wars, and government corruption matters not. We support it by not opposing it, by not welcoming the refugees fleeing from it. We lay claim to fear, forgetting that we are called to courage. We sing the praises of closed borders and ignore our culpability in the lucrative two way cross border trafficing of drugs and guns. These travelers have the vision and courage to embark on a perilous journey covering a thousand miles or more and the equal of any sea crossing. They are strong, determined and willing to risk all for a better life, indeed a better world. They are the kind of immigrants we should welcome. Perhaps their sense of purpose and strength of character will rejuvenate the American immigrant soul and save us from handwringing fearfulness and sanctimonious self righteousness that plagues us now." Beautifully written. Thank you for opening your heart and showing Christ's compassion to these refugees who do exactly as you say with the full support of the law, both US and international. It is far too easy, it seems, for Americans to forget that the countries they are fleeing collapsed and were replaced with failed states primarily because of US intervention in South America. We reap what we sow. I am humbled by your reply and will try to remain worthy of it.